What is Viscosity of fluids? For defining viscosity of fluids, Newton’s law of viscosity of fluid states that the shear stress between adjacent fluid layers is proportional to the velocity gradient between the two layers or you can simply remember that the viscosity if the resistance to flow. 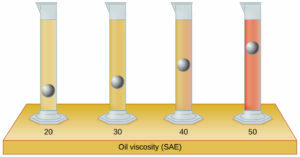 When water and oil are allowed to flow on any surface.You can observe that the water will move faster than oil.The reason for this particular matter is the viscosity of water is less than the viscosity of the oil.The si unit of viscosity is mm²/s.Viscosity is one of the main properties of fluids. The basic idea behind the viscosity is the molecular force between the particles in a fluid(Cohesive force).If a fluid has larger cohesive force, then you can say that it would have larger viscosity. The instrument used in the measurement of viscosity is viscometers.For the measurement of viscosity, there are so many types of viscometers are available for you, some of them are. These viscometers are working based on the pressure drop.In viscometer, you will get the direct reading of viscosity from the screen.The theory based on the measurement of viscosity using viscometers are explained in below picture. 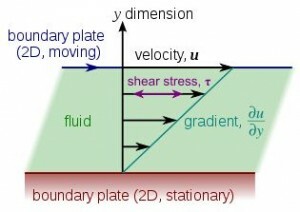 In above figure, the fluid is moving in the x-direction on the surface of a boundary plate.As you already know that, the fluid layer adjacent to the boundary plate will experience a high resistance to flow and that resistance decrease when the distance from the boundary plate increases. Theoretically, the velocity of fluid near to boundary plate will be zero and the maximum velocity will appear at top of the fluid.So a velocity gradient will occur as shown in the above picture. 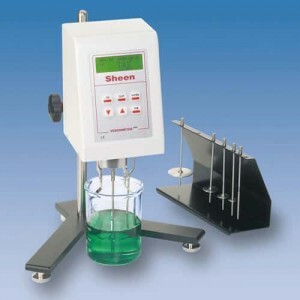 The viscosity can be measured with help of machines like capillary tube viscometer. There are two types of viscosity. The commonly used viscosity unit is centistokes.Also, viscosity units are also expressed in mm2/s. Dynamic viscosity is the measure of the resistance of a fluid to shear flow when some external force is applied.Dynamic viscosity is useful for describing the behavior of fluids under stress.It is useful in describing non-Newtonian fluids by observing how viscosity changes as the shear velocity changes. Kinematic viscosity is the ratio of dynamic viscosity to the density of that fluid. It is the measure of fluid’s resistance to shear flow under the weight of gravity. Force is applied weight here.Kinematic Viscosity measure of fluid’s resistance to flow, when no external forces except gravity is acting. Kinematic viscosity is more useful in describing Newtonian fluids. 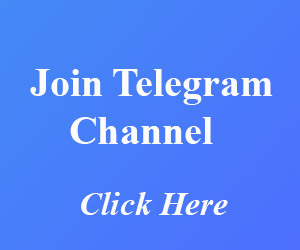 For gases, If temperature increases the viscosity will increase because when the bond molecular bond breaks, the collision between the particles increases this results in an increase in viscosity. I hope you can understand what is viscosity, types of viscosity, measurement of viscosity and factors affecting viscosity.If you like this post, don’t forget to share it with your friends.